The weather may get cooler, but the sun still shines brightly! Take advantage of the sun's rays and enjoy your backyard swimming pool well beyond the last days of summer with a Solar Pool Heater. 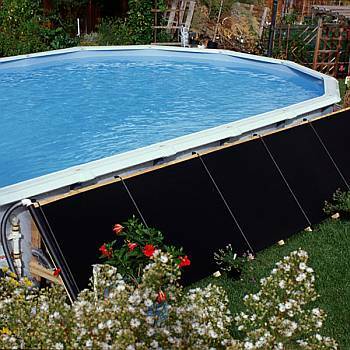 Solar Pool Heating Systems are super efficient and long-lasting. Our solar heating panels will raise your pool's temperature 10 degrees or more using the sun's free energy. When used in conjunction with a solar blanket, a solar pool heater will provide you with all the heat you need to swim comfortably into the cooler months - there is no expensive heater to buy and maintain, and you pay no costly gas bills. 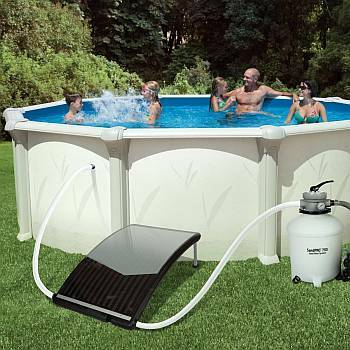 A solar heating system comes in a variety of sizes and models to suit your needs, whether you have an in ground pool or an above ground pool. 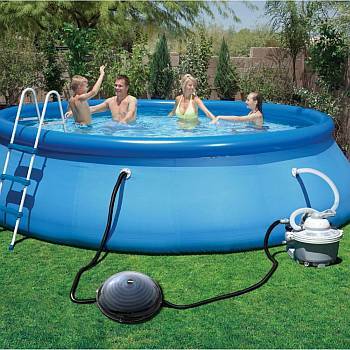 The solar panels do not include a diverter valve, so these systems will run whenever the pool's pump is operating. Connecting and diverter valve kits are sold separately. Our solar pool heating systems are extremely versatile - they can be mounted on the ground, on a rack, or installed on a nearby roof. 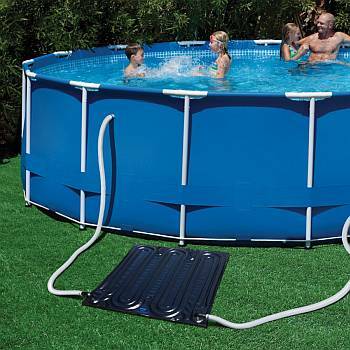 Both systems for In Ground Pools and Above Ground Pools are easy to install and come complete with instructions. 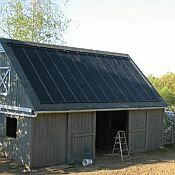 The panel plumbing / connector kit is used to connect your solar system to your filtration system and must be purchased separately. 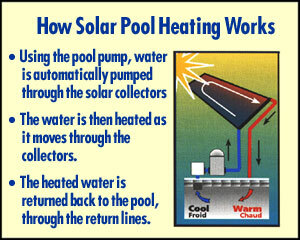 Put free solar heat to work for you this season with a quality solar pool heating system! Read more about using a Solar Pool Heater to help create an environmentally friendly and energy efficient pool in this informative article.